Some of the most famous battles fought in the Mediterranean during the war were coordinated from these headquarters, a 17th-century underground complex of tunnels and chambers. 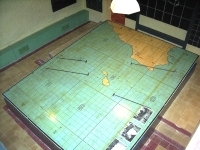 Now restored, it acts as a museum with displays of charts, models, and dioramas. It's fascinating to see all the old wartime paraphernalia and to explore the once top secret military operating rooms. Guides are enthusiastic and well-informed volunteers who greatly enrich the experience. Tours are conducted in English and take 75 minutes, after which visitors can freely stroll the grounds.